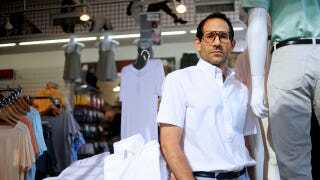 Dov Charney Just A Victim Of "Social McCarthyism"
While most people would be a bit concerned if they were hit with sexual harassment suits and their company was teetering on the edge of bankruptcy, that's not Dov Charney's style. Yesterday, he told WWD that despite American Apparel's deep financial troubles, Chapter 11 is "not an option." Today he continued his spin campaign in a Village Voice interview, explaining that people concerned about the sexual assault allegations against him are just uptight prudes. Well, actually Charney refused to discuss the sexual harassment suits directly, but his lawyer painted his client as the victim again, saying, "These women have fabricated claims. These claims are a result of their intention to try and cash out at the company's expense with no legitimate basis to do so." He also confirmed that Charney had a relationship with Kimbra Lo after she left the company, but claimed it was just a bit of consensual fun (she's accused him of sexually assaulting her at his home during an interview for a modeling/photography gig). This story's not over. I'm 42. I mean, Calvin Klein went from 300 million dollars in sales to 30, everyone thought he was over. Tommy Hilfiger had ups and downs. I'm 42 and everyone else is in their 60s. I'm the youngest guy out there and what's disappointing is that the youth media is killing their babies. There's nobody my age running a major apparel company. Nobody. I'm a stand-alone. We're coming off of a crazy recession that damaged many businesses, including the Village Voice. It's easy to be facetious. I received a number of prank phone calls yesterday, and one prank caller from London who I found remarkably interesting said, you know, that the reason she's so excited about me is that because she thinks there's a movement that is rejecting the notion that one needs to live a restrained life in order to make it right now. It's this agreement that's taken place between the politically correct left and the religious right, and we're experiencing a kind of social McCarthyism. Things are so tight that you can't just enjoy yourself and be free and transparent and open without getting stabbed for it. I hope to be a trailblazer, or someone on the forefront of thinking differently and being different. The thing is, we're talking about this PC left, this religious right, god forbid you make a joke that's wrong or you have an outburst. Pee-wee Herman — look at the disruption to the career of Pee-wee Herman, because of some minor improprieties. Look at how amazing an actor Paul Reubens is. The media and law enforcement really framed him up good on some minor improprieties at the expense of society. He's such a great individual and such a great actor. Look at how endearing his acting abilities are. It's a witch hunt. It's minor stuff that had no meaning. What did he do? Played with himself in a dirty theater? That's what those theaters are for, I thought. There's a class of people who don't think Michael Jackson was guilty of some of the things he was accused of. Not everybody believes what they read. The media — there's a nasty streak in the media. They succumb to stereotype. You know, I find myself reading stories that are salacious. What are you going to do? I know of many people that are excited to meet me and tell me that they're inspired by me. It's kind of interesting because there are so many people that admire what I do. I have a very large following ... I have academics that call me frequently and write me. I have employees that are extremely loyal to what I do — my mission. I have fans. Well, then. If Charney says he's beloved by the masses, who are we to doubt him?